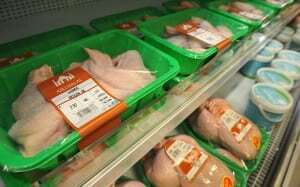 Shoppers will be told how their meat was killed, with all halal products required to carry labels explaining the method used to slaughter the animal, a minister has suggested. George Eustice, an environment minister, has given the clearest signal yet that the Government will introduce compulsory labelling of halal or kosher products. There has been growing concern that consumers are unwittingly buying meat that was the result of religious ritual slaughter after it emerged that diners had been unknowingly served halal chicken in Pizza Express and other restaurants. Under both the Muslim method of slaughter, known as Zabiha, and the Jewish practice, Shechita, a surgically sharp instrument is used to cut straight through an animal’s throat, windpipe and the blood vessels in its neck. Religious groups insist the method kills animals instantly, although this has been disputed by the British Veterinary Association. In both cases prayers are said over the animals. Shechita animals are not stunned before being killed. Some Muslim slaughterhouses also neglect to “pre-stun”. Critics say such practices harm the welfare of animals. A number of backbenchers have called for food labels to contain the precise method by which the animal was slaughtered. Addressing MPs, Mr Eustice said: “[Backbenchers have] made the point that it would be wrong just to label meat as ‘stunned’ or ‘unstunned’, and that a fairer way would be to list all the different methods of slaughter. “The only thing I would say in response is that, from the EU perspective, ‘stunned’ has a clear legal definition in the legislation, and it is simply that an animal is rendered insensible to pain almost immediately. Mr Eustice said it would be “difficult” to brand meat products kosher or halal because “there is no single definition of halal … and a further complication is that not all meat slaughtered by kosher methods is deemed kosher”. Huw Irranca-Davies, the shadow environment minister, said that labelling meat halal or kosher had been “roundly and rightly rejected” by MPs from all parties last year. However, he said: “Should all different types of slaughter be labelled for the consumer? In that case, make room on the label for slaughter by electrical current, or by carbon dioxide, inert gas, captive bolt pistol, gunshot or free bullet and so on.